Providing a trusted British voice to the e-learning industry - at very reasonable rates. 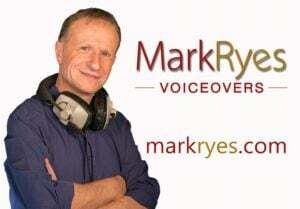 Mark Ryes Voiceovers provides Mark's trusted, calm British neutral voice to a variety of projects, including e-learning, from our studios in Oxfordshire, United Kingdom. Mark is an award-winning, highly experienced voiceover artist, with e-learning credits including Relias Learning, Engage in Learning, Jincom Communications and a huge number of corporate companies. He's able to deliver broadcast quality, but he's just as happy to travel to studios across the UK. He's available to record every day, can deliver fast turn-around times. Mark's recent clients have included: National Health Service UK, Vodafone, Lendlease, HSBC, EE, Wix, Bosch, GSK, Landrover, Unilever, KPMG, Mercedes Benz, Nestle, ATP World Tennis Tour, Thames Water, Subway, Which magazine, Deloitte, Wickes, Halfords, Ferrero, Lloyd's Register, Network Rail, Phillips, Direct Line, Thomas Cook and many more. Read reviews and discover other eLearning Industry community members's experience with Mark Ryes Voiceovers.